Free Shipping Included! Save 1% on the Zensah Plantar Fasciitis Sleeves (Pair) – Plantar Fasciitis Socks, Arch Support, Plantar Fasciitis Brace – Relieve Heel Pain, Arch Support, Large, Black by Zensah at Bijc. MPN: 6325. Hurry! Limited time offer. Offer valid only while supplies last. The Zensah plantar fasciitis sleeves are designed to help reduce plantar fasciitis pain through its unique t-band compression and 3D Geo technology. The Zensah plantar fasciitis sleeves are designed to help reduce plantar fasciitis pain through its unique t-band compression and 3D Geo technology. The t-band compression lifts the plantar fascia and helps to stretch it, while the 3D Geo technology provides pin-point compression to relieve arch and heel pain. The plantar fasciitis sleeves are made of moisture wicking and anit-odor fabric, ensuring the sleeve stays light and dry all day long. 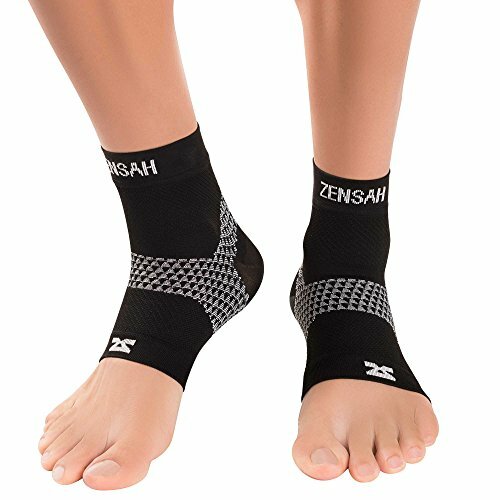 Get plantar fasciitis relief with the Zensah plantar fasciitis foot sleeves. The Plantar Fasciitis Sleeve is a unisex product. Please follow the size chart below.